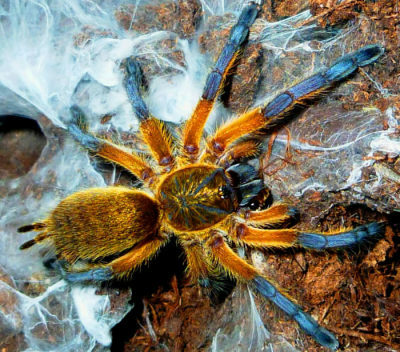 The Golden Blue Leg Baboon Tarantula has rarely been seen in the hobby and is considered one of the most desireable tarantula species today. It is also classified on the IUCN Red List as "critically endangered" and should be treated with great care and respect. 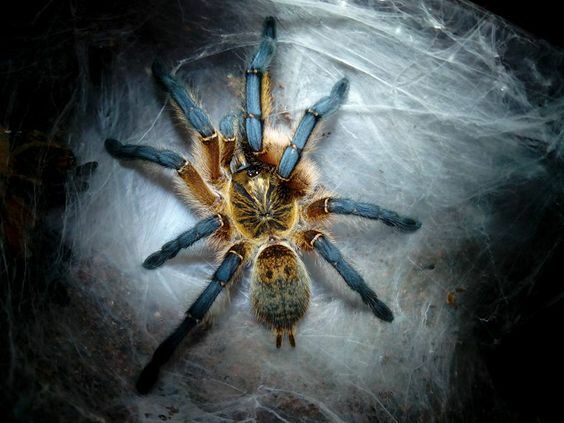 The Golden Blue Leg is a terrestrial old world spider from South Africa and has incredible metallic blue colorations on its legs complemented by a golden starburst pattern on its carapace and abdomen. Juveniles have a somewhat rust or brown color but these colors will fade as it grows and is replaced by the beautiful hues of blue and orange. The H. pulchripes likes to burrow but young spiderlings are often active climbers as well. They are inclined to create an extensive web in, and around their burrow if given the space to do so. Early reports suggest that this particular baboon (bird eater) is calmer than other members of the genus and is more likely to retreat into its burrow than to strike. The venom is considered to be "medically significant" although there is not a lot known about its effect on humans. Our spiderling has proven to be very photogenic as evidenced by the pictures seen below. Our decision to add this beautiful yet rare spider to our collection was based on several important considerations aside from its obvious beauty. 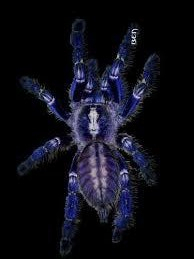 This is a medium sized spider whereby adults can reach about 5-6 inches in length. They have a fairly long lifespan with females living up to 12 years old with males living to be about 3-4 years old. They are reasonably hardy and fast growers although sexing our spiderling will not be possible until is has reached a subadult stage of maturity. Its calm temperment, hardy metabolism and striking beauty should make the Golden Blue Leg a welcome addition. 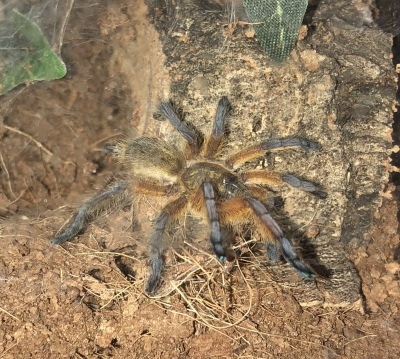 The Golden Blue Leg is a terrestrial species that requires a modest sized enclosure with adequate hiding places, good ventilation and high humidity. 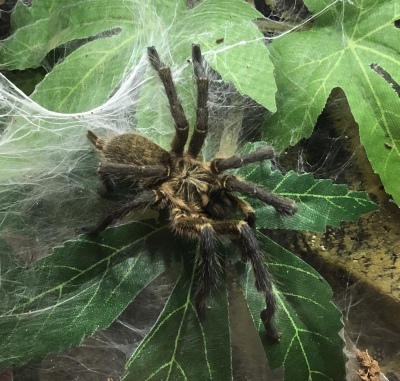 Juveniles are initially kept in a smaller, acrylic enclosure designed by Jamie's Tarantulas and are eventually transferred to their permanent home after two to three molts. 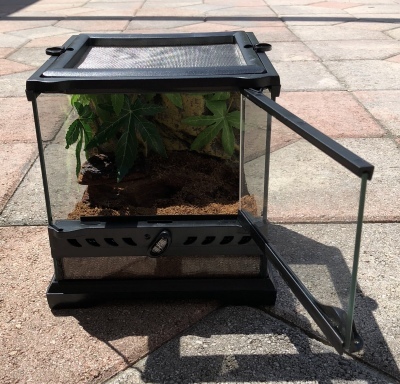 We may use an Exo Terra terrarium (see below) due to its ideal size, easy access and favorable lighting feature but any acrylic or PVC container with a secure lid will suffice. We use a cocoa bark substrate, a bark "cave" along with a few artifical vines with a small water dish secured to the side of the enclosure. The idea is to provide adequate hiding places for a stress free environment. 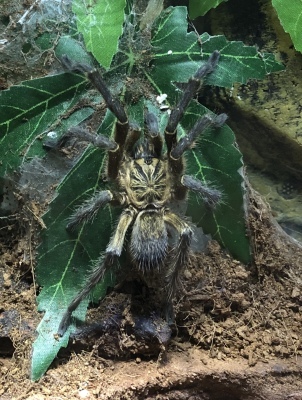 Like all of our tarantulas, the H. pulchripes will start on a diet of pin head crickets and move up to various sizes of B. lateralis roaches. We have an active colony of these insects which are clean, do not fly and have no bad habits. Our spiderlings is about one and a half inches and growth rates are considered above average. Daytime temperatures are in the high 70's to low 80's and the substrate is misted with water about once or twice a week. Early observations suffest that they are good feeders and we anticipate a fairly fast rate of growth. Our spiderling did not take long to leave the comfort of its mailing tube and make itself at home in its grow out enclosure. We fed our new arrival a 1/4 inch cricket which it immediately devoured which is a good sign to say the least. Pictured to the right, our spiderling has begun construction of a tunnel web and is already showing its true colors. the Golden Blue Leg has been spending more time outside of its burrow as it gets older which is encouraging. It responds quickly to periodic mistings of distilled water we noted as well. This has been a very easy to manage addition thus far and very photogenic as previously noted. This afternoon we transferred our Golden Blue Leg to its new home. We used an Exo Terra 8 X 8 X 8 enclosure and carefully removed our T from the old cage using a large PVC container just in case our Blue Leg tried to escape. The entire process went smoothly and we were able to move the tarantula using a capture cup and lots of patience. We fed him/her five (5) crickets the day before which should give it plenty of nourishment for remodeling his/her new home. Our Golden Blue Leg has settled into her new home quite well and has been busy remodeling the enclosure. 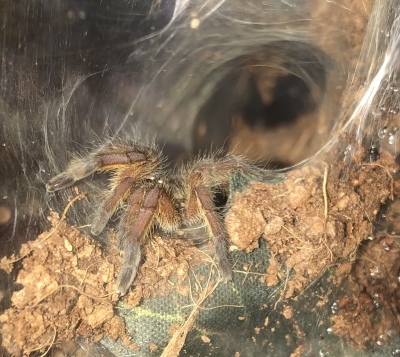 She has molted at least once since her last molt and is noticeably larger in size. The picture on the right was taken with LED lighting and does not reveal much of the blue in her legs as in previous pictures taken with a flash. 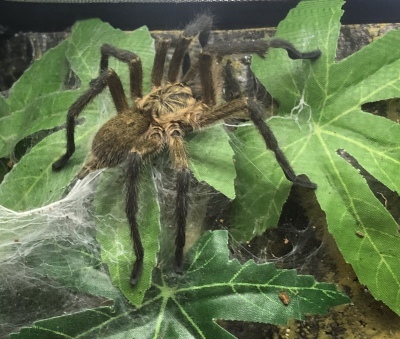 Our T continues to eat well and appears to have molted once again since December. In the most recent picture (below right) you can see some of the blue in her legs starting to show. The starburst pattern on her carapace is really impressive.